For the doctors, performing in an acoustically superb venue and sharing music with others is a remarkable experience. "Performing in front of a large audience with professionally-done sound and lights is really cool," affirms Dr. Robert Hermanowski, 45. "How often are you going to play like that?" Hermanowski, a psychiatrist, plays bass guitar in the band Collideascope, whose other members include two counselors and a probation officer. The band formed in 2005 at the community mental health center where the bandmates work. When Collideascope isn't performing their Beatles-inspired original compositions at Docs Who Rock, they play at local clubs and music festivals. They most recently appeared at the Clay's Park Resort Rock Festival, which also featured Todd Rundgren. The band has released two favorably-reviewed albums and is currently working on a third to debut in 2011. You may not be right for this" chant the guys in Akron-based Collideascope on the title track of their second album. With its electric pop beat and staccato singing, the song sounds very much like another Akron band, Devo. The 13 songs show how much the group has been influenced by other bands. Both the singing and the melody of "Outta Sight, Outta Mind" suggest a Britpop influence, and the tune also uses a small part of "Day Tripper." It's a nod to bassist Rob Hermanowski's deep admiration of the Beatles, especially Paul McCartney. The rest of the CD combines classic-rock, Britpop and southern-rock sounds, as well as psychedelic- and indie-rock. . . To their credit, the guys successfully blend all these sounds into one. 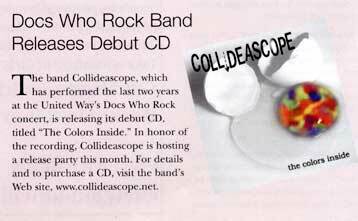 . . "
Collideascope's roots as a cover band are on display on its debut. The Colors Inside is happy-go-lucky rock indebted to Cheap Trick and the Who, while catchy tunes like "Catch 22" and "Don't You Know" showcase a serious Beatles infatuation. All four members of the Akron quartet share vocal duties and writing credits. Although the results are always easy on the ears, The Colors Inside could use some darker moods... The album just floats along pleasantly. (The Colors Inside)...contains 11 original, self-produced tracks. Comprising straitforward, feel-good rock 'n' roll, The Colors Inside has the vibe of many of the band's influences including the Beatles and the Who. It also pays homage to rock 'n' roll icon Fats Domino in "Domino. "; Standout tracks include "It's Not Love" and "Don't You Know" which exhibit groovy guitars and intricate vocal harmonies. Don't let anyone tell you there's nothing happening musically in Ohio, just because there aren't too many area artists making googobs of money for guys in suits in L.A. and New York. 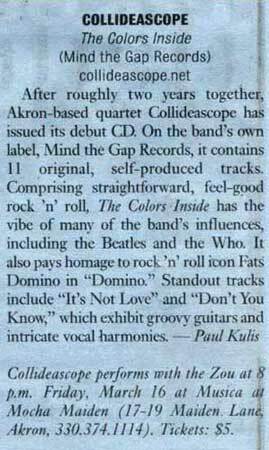 Collideascope is an Akron quartet that's been around for a few years and records for an Akron label called Mind the Gap Records. The band counts Cheap Trick and XTC as influences and the best songs on its all-original 11-track CD, such as Catch 22, the unrequited love tune Hero and the album closer Reckless Radio, contain the taut, constructed arrangements and plenty of friendly background and harmony vocals of the band's influences. I've never seen it live, but in the studio the band's playing is energetic . 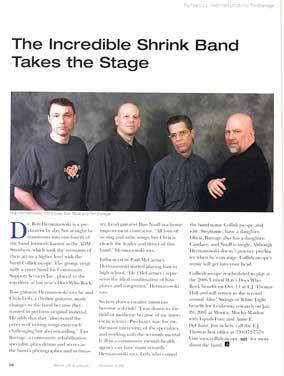 . . there are plenty of bands that shine live (NRBQ being a classic example), so if you want to check Collideascope out under the stage lights, you can catch it playing at various clubs and festivals in the area. More info at www.Collideascope.net. Creston's annual summer festival is a crowd pleaser Umbrellas briefly blossomed over Homecoming parade watchers gathered along Main Street as drops fell from a passing cloud... The parade was part of four days of festivities that started out with amusement park rides and a matinee at the park, followed Friday by a fish fry and T-ball tournaments. The Norwayne High School Band, along with with rock band Collideascope and country music band Texas Toast, performed for avid listeners. Finally, a presentation of citizen of the year awards and the August 19 parade rapped up festivities. Strings of White Light Memorial Benefit Concert for Phyliss Shilliday (featuring Anne E. DeChant, Equals Four, and Collideascope) Winter returned to Akron, Ohio, on Saturday, February 25, but you couldn’t tell from the red hot rock ‘n’ roll that was performed at the Alive! – Strings of White Light Memorial Benefit Concert. As snow began to fall outside, Ruth Ottiger, organizer of the benefit, promised a very special night - and she delivered. The benefit was in honor of Phyliss Shilliday, a friend of Ms. Ottiger’s who worked as a relapse prevention counselor in the Summit County area, who succumbed to a long battle with leukemia in December. Kicking things off in grand style was a quintet from Akron making their debut. Collideascope took the stage and for 45 blistering minutes delivered a set of high energy original music, with a few covers sprinkled in. An original tune, ‘Now and Then,’ got the ball rolling and the group entertained the audience very well. Collideascope’s efforts were met with enthusiastic applause and impromptu dancing from the capacity crowd. The band also gave their own unique spin to such songs as The Rolling Stones’ ‘ Satisfaction’ and Blondie’s ‘One Way or Another.’ A highlight of Collideascope’s set was ‘Domino,’ a song, according to the intro, that was especially written for the occasion of commemorating Ms. Shilliday’s life. It rocked the crowd very well while also pulling a few heartstrings along the way. Be on the lookout for Collideascope’s first CD, which should be available this fall, and catch them at their shows later this year. After a tantalizing taste of what this group can do, they are sure to be a band you won’t want to miss.